The Hulk Bean | Gurney's Seed & Nursery Co. 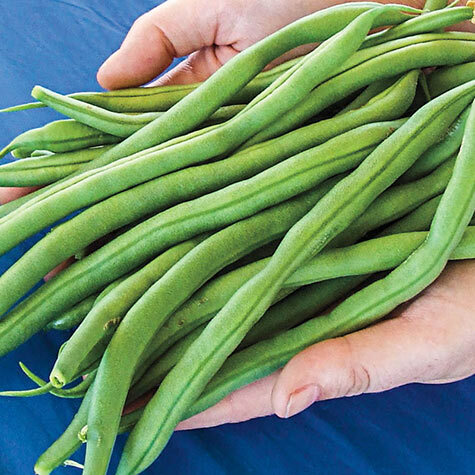 These beans grabbed our attention with their gigantic size, up to 9 inches long — and do they ever have big flavor to match their big size! Tender, meaty and stringless, these wonders will become a must have in your garden for years to come. 58 DAYS. Seed counts: A 2-oz. packet of bush bean seed contains about 150 seeds and sows a 25-ft. row. Did you know… recently introduced, The Hulk Bean lives up to its name with large, tender and stringless beans sure to please. Fruit: Extremely large, long podded beans, medium green pods with white seeds. Up to 9 inches long. Seed Count: 2 oz. packet contains approximately 150 seeds. Comments: Stunning new bean discovered in field trials! When we first noticed this beans it was due to their monstrous size- 7, 8, 9 inches long. And do they ever have a giant flavor to match their giant size! Tender, yet meaty, and stringless, with a sweet, fresh true green-bean flavor. Will become a 'must-have' in your garden for years to come!